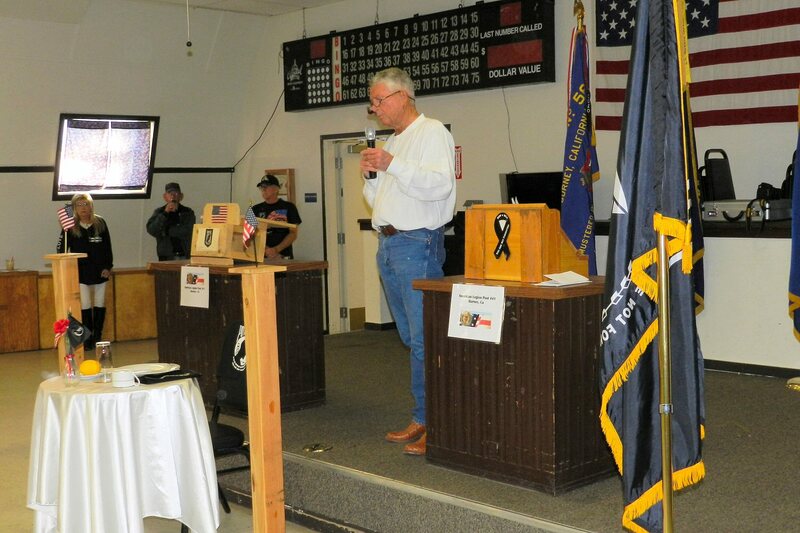 Members of American Legion Post 441, VFW Post 5689, and VFW Auxiliary 5689 and citizens from the Intermountain Area came together on the evening of Saturday, September 15 at the Veterans Hall in Burney for a special ceremony to remember and honor prisoners of war and soldiers missing in action. 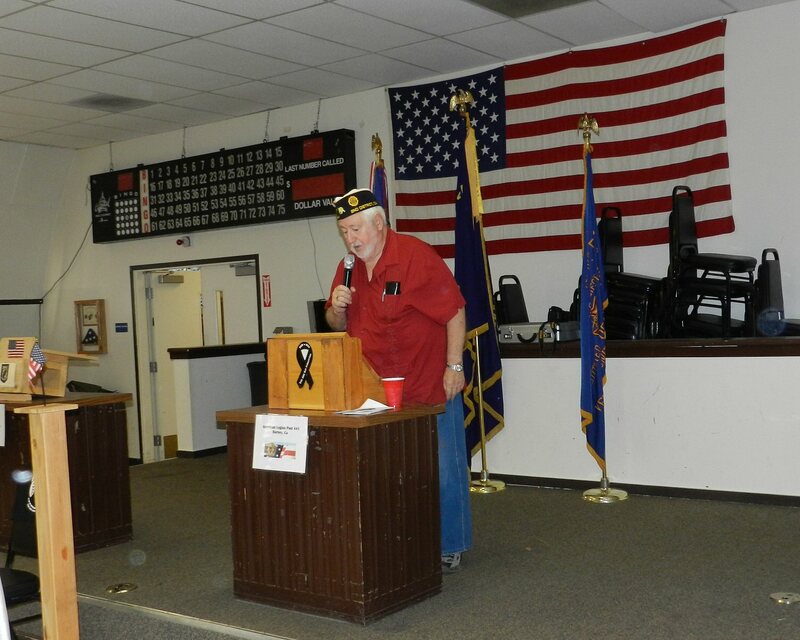 American Legion Post Adjutant Bob Boyce served as Master of Ceremonies. American Legion Post Commander Steve Sweet and VFW Auxiliary President Dee Covert were in attendance. Boyce read a heartfelt statement of support from VFW Post Commander J.P. Wheeler who was unable to attend because he was coaching a football game in Oregon. 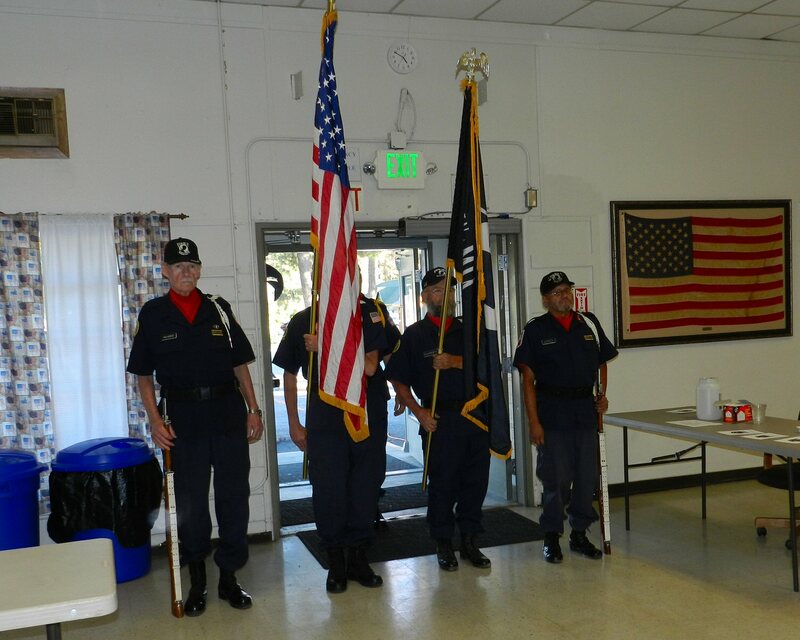 The ceremony began with Presentation of Colors by the Honor Guard, staffed by Jim Arveson, Dennis Lopez, Herb McKinney, George Mathews, and Marty McAbee. Lynn Bolen read a moving testimonial entitled “Behind the Wall.” The piece was written from the point of view of a soldier who had sacrificed his life in Vietnam. From behind the wall of the Vietnam Memorial in Washington DC, he recognizes his mother, his wife, and his son as they come forward to the wall to read his name and honor him. The son has grown and is now a decorated veteran himself. Bolen was given a copy of Behind the Wall by a sympathetic Park Ranger when he visited the memorial. More than 3 million people died in the conflict in Vietnam from November 1, 1955 to April 30, 1975. Fifty-eight thousand American soldiers lost their lives. 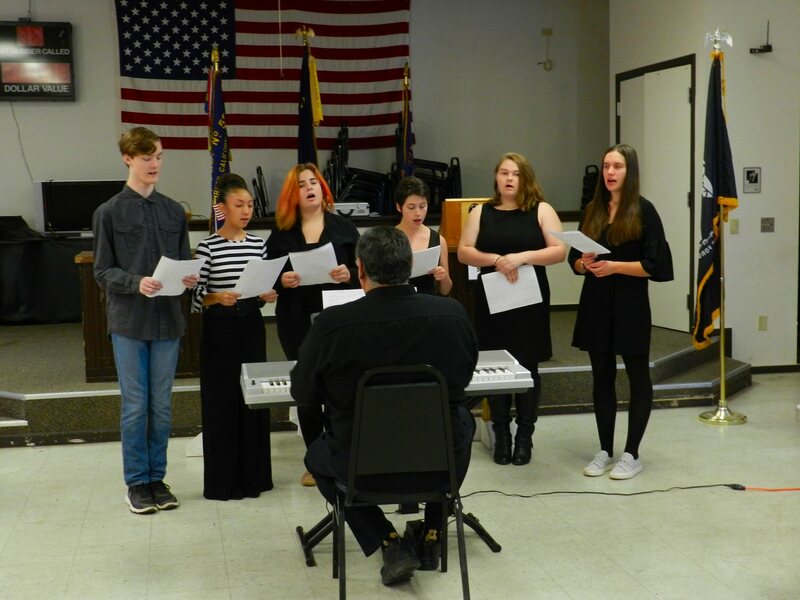 Following Mr. Bolen’s talk, the Burney High School Vocal Ensemble sang God Bless America and America The Beautiful under the direction of Hugo Castro. 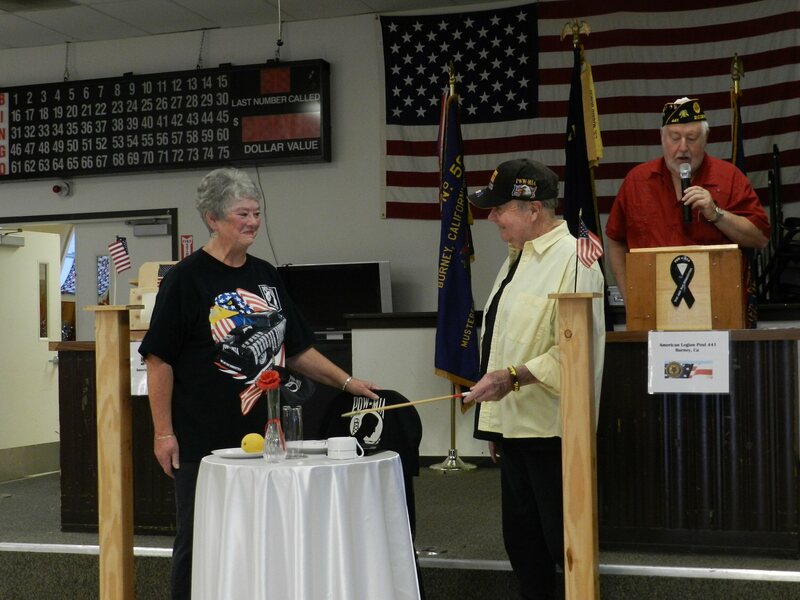 Past American Legion Post Commander Bill Baldwin and his wife Tina then displayed an Empty Table Setting as Boyce narrated the symbolism of the scene. Everyone raised a glass in honor of those who had made the ultimate sacrifice. After the table setting ceremony, various pairs of veterans came forward to read the names of all 1,594 Vietnam POW/MIA’s. After the reading of all of the names, buglers George Mathews and Hugo Chavez played Echo Taps. 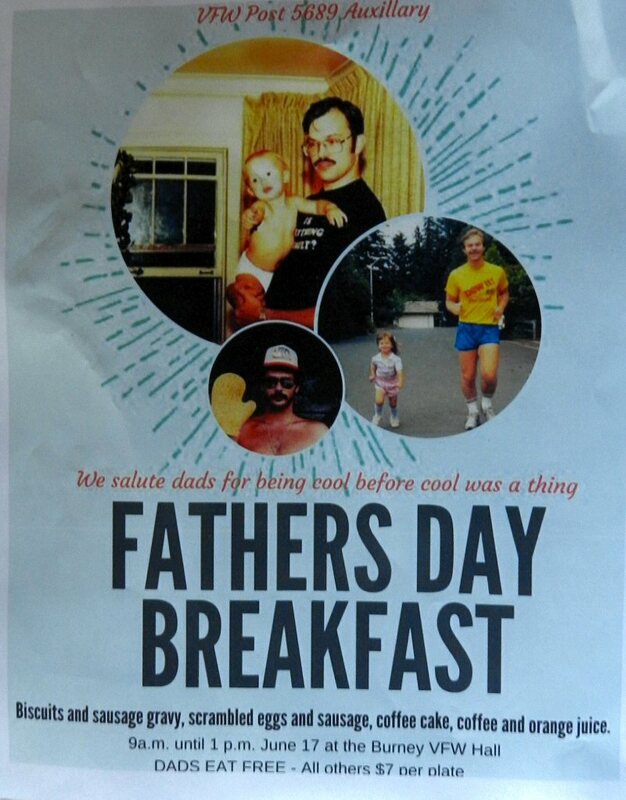 VFW Post 5689 Auxiliary will be serving a Father’s Day Breakfast from 9 a.m. until 1 p.m. at the Burney Veterans Hall on Main Street on Sunday June 17. The breakfast will include bisquits and sausage gravy, scrambled eggs and sausage, coffee cake, coffee, and orange juice. $7 per plate for others. Bill Baldwin will be Grand Marshall for the 2018 Burney Basin Days Parade on Saturday, July 7. Mr. Baldwin was born in Omaha, Nebraska and lived in Utah and Idaho before moving to California around the end of World War II. After graduating from high school, he married his first love Sue. Together they had four wonderful children: Nanette Marie, Janine Rose, Daniel Joe, and Dean Carrol. He earned a Bachelor’s degree and is a member of the St. Francis Catholic Church in Burney. Mr. Baldwin served in the military for 5 and 1/2 years with 31 months combat duty in Vietnam. He was a U.S. Army Airborne Ranger with the 5th Special Forces Group. During that time he received numerous decorations including two purple hearts, two bronze stars, and a Presidential Unit Citation. He was honorably discharged in 1968. He has worked for Publishers, worked in the woods, worked as a handyman and roofer, and as a substitute teacher. He retired from Shasta County Public Works after 17 years of service. Mr. Baldwin has helped with many community improvements and served many organizations. He was involved in the restoration of the Little League Park. He coached both Little League and Youth Basketball League. He served on the Fire Board, as PTA president, and as a Burney High School Project Mentor. He is a life member of American Legion Post #441 where he has served as Youth Commissioner for more than 20 years. 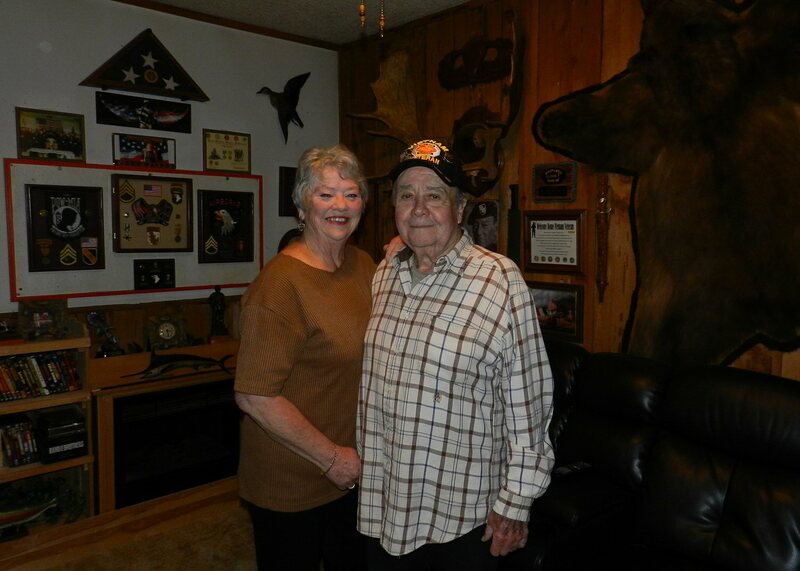 This year his family created the Bill Baldwin Community Service Scholarship Fund that is administered by the American Legion. Mr. Baldwin was able to present the first scholarship at this year’s Senior Awards Assembly. As an original member of the Burney Veterans Honor Guard he served in positions from Rifleman to Commander. 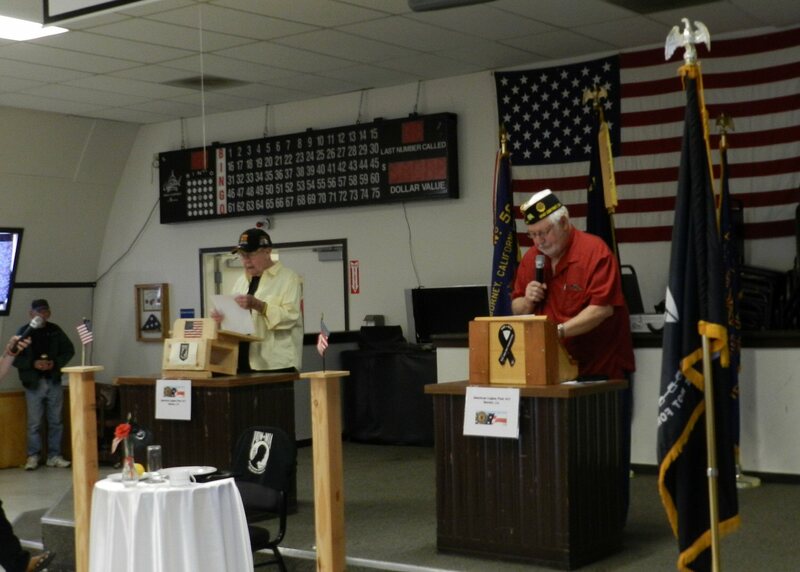 Although he is not a member, he proudly supports Burney VFW Post 5689 and all other Veterans organizations. 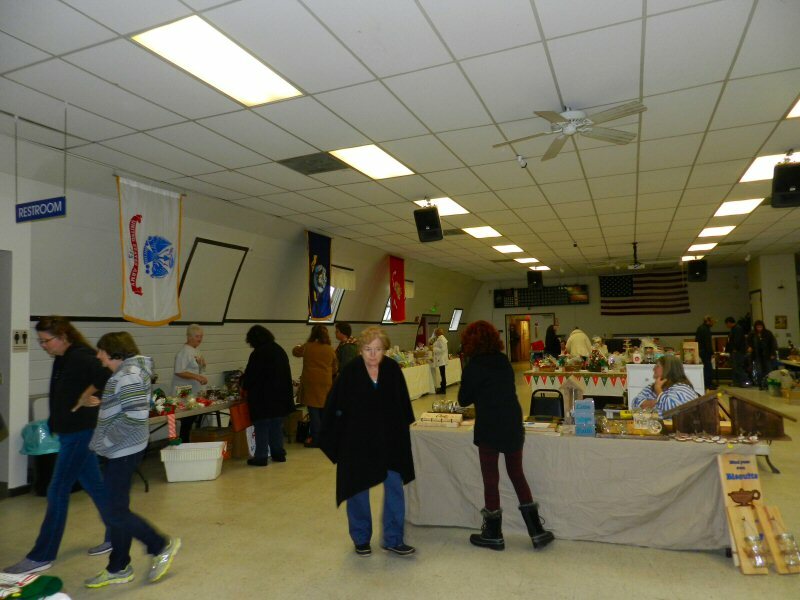 On November 19, the VFW Auxiliary Post 5689 held an indoor yard/bake sale at the Vet’s Hall in Burney. About one dozen vendors participated selling new and used items as well as crafts and baked goods. Dottie Sales had a booth for the Veterans and cheerfully welcomed and thanked all who came. 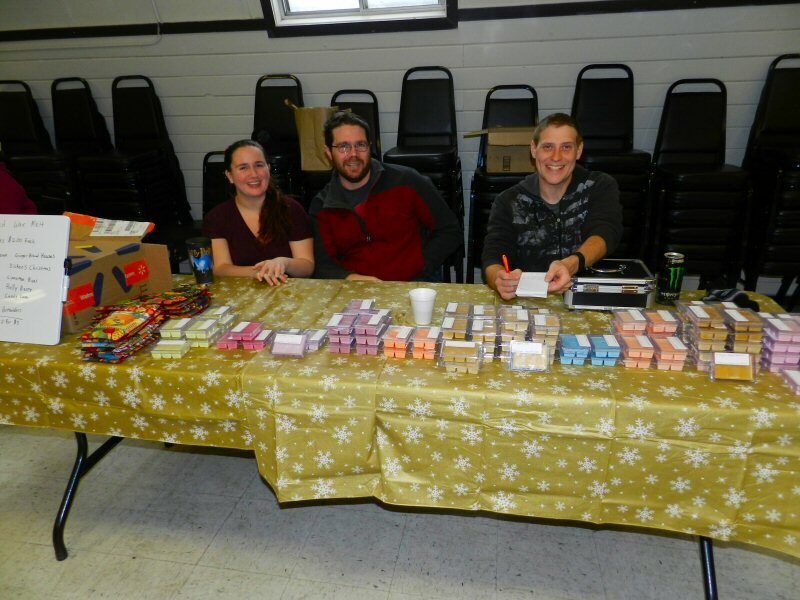 I personally enjoyed visiting the table of Joel Francis and two of his friends who were selling scented wax melts. Joel makes the wax melts from natural soy wax adding a variety of fragrant and pleasing essential oils. He lives in Burney and operates his business year round. If you would like to learn more about his scented wax melts and warmers you can reach Joel at 530-238-0399. Meanwhile, back in the kitchen the Auxuliary had prepared hot soup and rolls – perfect for a snowy day.